The J-POP Summit Festival is the Bay Area’s premier annual Japanese pop culture celebration featuring a variety of live bands and artists, pop culture panel discussions, film premieres, fashion shows, DJ dance events, interactive games, celebrity appearances, and much more. Many of the attractions are free to attend. The Festival is hosted by J-POP Summit Festival Committee in cooperation with the Japantown Merchants Association. Additional details will be forthcoming at www.J-POP.com. 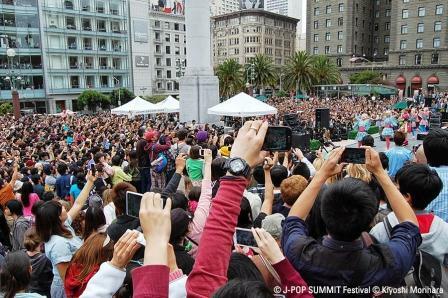 In 2013, J-POP Summit welcomed more than 80,000 people to Japantown and nearly 10,000 more music fans to the Festival’s first-ever concert held in Union Square that featured Japan’s Ambassador of Kawaii, Kyary Pamyu Pamyu, as well as Kylee, Daichi, and LoVendoЯ. The downtown San Francisco Union Square stage will host a compelling line-up of J-Pop artists again next year. Also returning as part of the 2014 J-POP Summit will be the second annual Japan Film Festival of San Francisco, the only full-fledged Japanese film festival held in the Bay Area. The week-long series of live-action and anime film theatrical premieres will run Saturday, July 19th through Sunday, July 27th at the NEW PEOPLE Cinema and will be highlighted by red carpet events featuring appearances by prominent Japanese directors and actors, as well as several lecture presentations, workshops, autograph sessions, and film industry networking opportunities. Additional information will be available at: www.JFFSF.org. Showcasing cutting edge Japanese fashion has always been a popular aspect of the J-POP Summit. 2013’s theme of “Making Kawaii Universal” resonated with thousands of attendees that savored leading brands as well as live shows featuring top models from the bustling Harajuku fashion scene including Kyary Pamyu Pamyu. Next year’s programming will present even more brands and icons to highlight a wide selection of exclusive designs, apparel, and accessories only available for a limited time during the Festival. The 2014 J-POP Summit Festival also will present the return of the POP GOURMET Food Festival, which will delight attendees with a scrumptious array of innovative Japanese and Asian-influenced cuisine along with Japanese sake and teas. Festival-goers will be able to enjoy popular local gourmet food trucks and exclusive sake tasting by premier sake distillers/distributors on an even bigger scale.